The American Alcohol Industry Watchdog, the Marin Institute recently reported of a banner campaign from Anheuser-Busch InBev for Budweiser “Family Packs”. Umpqua Partners for a Drug Free Future, the organization which spotted the ads, was quick to start an online petition asking Anheuser Busch InBev to take down all “Family Pack” advertising. 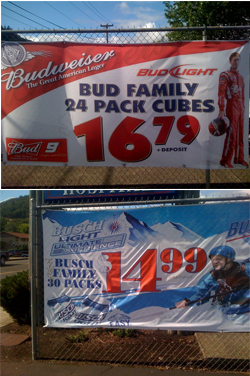 On the 13th of January Patti LaFreniere, Executive Director of Umpqua Partners states that Anheuser/Busch beer distributor, Western Beverage had informed her that the two banners advertising Bud and Busch Family packs were removed, and that all local ads would be removed on the same day.